Purpose: To defend the Earth against mankind's abuses. They fight modern-day threats such as terrorism and pollution instead of their medieval equivalent. Powers: The Knights of Pendragon possess the Champion Spirit of Pendragon, which is the power that invests certain individuals when it becomes necessary for them to take a stand for the greater good. It makes champions of exceptional men...and women, and it's been doing that since the days of Arthur...or even earlier. It attunes the individual to the natural cycle, urges him or her to defend the essential fabric of all that is important...all that is "good" to use an inadequate word. And it teaches us to recognize the threatening foe in its true form. Each Pendragon carries with it the past incarnations of its champions. The Pendragon energy is not specific to Great Britain, but exists in other places, under other names, and even in other dimensions. The Pendragon spirit grants them heightened abilities, powers and senses which become exaggerated to super-human levels. They are able to tap into the power of the Earth itself, which manifests as a lighting-like energy they refer to as 'Pendragon Fire'. The enhanced abilities granted to each individual vary, and are sometimes accompanied by a physical change in size and mass. Union Jack, for example, gained two stone (28 lbs.) 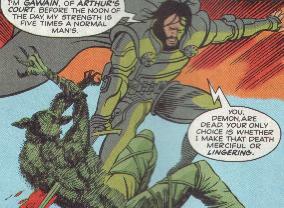 and grew three inches upon gaining his Pendragon spirit, becoming the strongest of the group (he had Class 10 strength and enhanced endurance), while Peter Hunter has the unique ability to become his super-human alter ego Albion at will. The entire group has the ability to converse with animals. They are also able to sense their opposite, the Bane, to varying degrees, and are attuned to the workings of nature. Sometimes they experience Pendragon visions warning them of various dangers in the future or the present, and often at great distances. Occasionally this seems to manifest as a warning flash, or danger sense, in a manner similar to Spider-Man's own Spider-Sense. The Knights later discovered suits of armor that enhanced their abilities, powers and senses even further. The armors had battle computers that provided strategic advice in combat and could warn of potential dangers such as harmful radiation. They could also take control of the users actions if need be to prevent them killing another Pendragon. Each suit reacted to the individual's Pendragon power and molded itself to fit. They were also capable of 'evolving' into new forms, though this only happened once see comments. History: (The Knights of Pendragon I#10 (fb)) - Since the days of King Arthur, and possibly even earlier, the Pendragon power has been invested upon exceptional men and women when it became necessary for them to take a stand for the common good. Each Pendragon carries with it the past incarnations of its champions. (Blade III#9 (fb) - BTS) - The Knights of Pendragon allegedly broke off from the Order of Tyrana in the past. (The Knights of Pendragon I#8 (fb)#10 (fb)) - A year before the first world war, Peter Hunter was invested with a Pendragon spirit while on the copse outside Gatton School, Wiltshire. When war broke out he became Albion. His first encounter with the Bane was in Flanders. (The Knights of Pendragon#7 (fb), 9 (fb), 10(fb)) - The Pendragon in Ben Gallagher gave him an uncanny intuition, and a fascination with the grail. He decided to become a writer, and wrote a book about the grail with clues as to its whereabouts. He had a grail made and buried at the Kitsford Countless Stones in Kent, keeping the location to himself. (The Knights of Pendragon I#1,#6 (fb)) - The Green Knight became angry towards the human race as its people began to commit more and more crimes against wildlife and the environment. As the Earth suffered, so did the Knight. In order to reset the balance, he began to fight back. As such, the Green Knight was responsible for the death of Thor Karlsen, leader of the Beluga Busters - a cartel of businessmen who had been capturing and killing Beluga whales for up to �1,000 per day. Karlsen, a board member of Omni-Corporation, was hacked to death with a harpoon that was over 400 years old. The Green Knight then arranged for Sir Hugh Beaumont, head of Capefresh to meet with an untimely fate - he was found dead in his office, vacuum packed and irradiated in much the same manner as his company used to preserve fruit. The Green Knight was then involved in the death, by what appeared to be suffocation, of some eighty seven people in an incident at a Tastee Burger bar, Central London, and an out-break of Legionaires disease at Tastee's meat recovery plant in Wales. Around this time Dai Thomas began to be possessed by the same Pendragon spirit that had once inhabited Gawain, stirred by the Green Knight's cries of rage. (The Knights of Pendragon I#1) - Whilst sleeping, Dai Thomas had a Pendragon vision of events at the Tastee Burger bar. He awoke just in time to catch Kate McClellan's report on the incident for Astra News. Alysande Stuart called an emergency meeting at W.H.O. 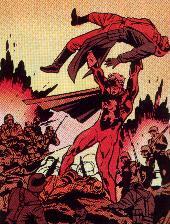 headquarters and sent Captain Britain, who had been first at the scene of the incident, to collect Dai. Brian arrived at Dai's home in Gower, South Wales, and flew him to the meeting. Whilst there he met Templeman, a member of W.H.O. 's Esper Corps who had been having nightmares since the death of Thor Karlsen, and had "felt" the deaths of those at the Tastee Burger bar. Templeman became irrational, ranting and raving. Dai knocked Templeman out, but not before recognizing that he'd been quoting lines from "Gawain and the Green Knight". He decided to keep quiet about his own nightmares. Thomas and the Stuart twins investigated the scene of the Tastee Burger incident, and they discovered that Omni Corporation owned the franchise. Whilst there they briefly ran into Kate McClellan. Kate was made to leave, but surreptitiously followed the trio's car. Dai fell asleep and had another Pendragon vision, this time of Gawain in battle with the Bane. The vision told him of another incident at a farm in Sevenoaks, Kent. When he awoke, Dai and the Stuart twins were diverted to investigate that very incident. Kate McCellan and her crew followed. It appeared the farm had been using a chemical called 'Assassin' that contributed to the Greenhouse effect, vast quantities of Pesticide and drums of nitrate fertilizer. The remains of the farm owner's body where found in the strawberry punnets. (The Knights of Pendragon I#2) - Dai was flown out to Tsavo East, Kenya, in order to investigate the death of Conrad, a director of the Omni Corporation who had seemingly got himself trampled in the bush. Yet again, Kate McCellan followed him using her contacts at Astra. Dai ran into her as she was interviewing Mr. Jan Van Ocken, an associate of Conrad who was yet another member of the Omni Corporation. Kate accused him of being involved in illegal fur trading. Dai's dreams continued, and there was yet another incident as a poacher's helicopter was attacked. Dai had been told how the ivory poachers shoot elephants in the legs, cripple them, and then sever their spines with axes before stripping them of their ivory. However, he was stilled sickened to find the poachers body mutilated in much the same manner, his teeth and bones stripped from his body. Dai found evidence at the scene linking Van Ocken to the ivory poachers, but before the criminal could be bought to justice he was also killed. Van Ocken's decapitated head was found with his skin wrapped around it in the same manner he had used to prepare animal pelts for transport. (The Knights of Pendragon I#3) - Both Dai and Kate traveled to Florida to investigate a pet-smuggling ring. They discovered the wreck of a coast guards ship near Sand Key. The ships crew had been under investigation, suspected of dealing with smugglers. Kate arranged a meeting with Ricou Mendez, an Omni Corporation member linked to the smugglers, but her questioning revealed nothing. Dai drove them out to the home of Julio Moreno, one of the dead coast guards. Whilst Dai discovered the boathouse was full of caged birds, Kate found evidence linking Mendez to the smuggling. They accompanied the Florida coast guard as they attempted to board Mendez's private ship, the Icarus. Mendez ordered his people to fire upon the coast guard, and Dai was hit. Just as it appeared the Icarus would triumph, it was attacked by a giant sea monster seemingly composed of oil. As the Icarus sank, the monster poised over the coast guard's ship. Dai managed to communicate with the creature, and it left. Unbeknownst to him, theses events had been witnessed by Dolph, an Omni Corporation operative. (The Knights of Pendragon I#4) - Dai followed the trail of the pet-smugglers to a makeshift airstrip above Belize City, Central America, telling Kate not to follow. He took on the smugglers, and the birds escaped from the crates they had been inhumanly packed into. Once Dai had stopped all the smugglers thugs, he looked for their bosses, only to find they had been killed already. Their bodies had been stuffed into the crates by a bird-like creature. Dai attempted to communicate with it, but it flew away. Kate arrived and gave him a lift back to the city to meet Brigadier Stuart. She informed him that he had been taken off the case, as per Sir Ian Chalmers instructions. Meanwhile, Dolph and a group of Omni Corporation mercenaries organized a hit on Dai. The former policeman made short work of them, with his new Pendragon enhanced abilities. Dai said goodbye to Kate, and left to continue his quest. Captain Britain was ordered to find Dai, and bring him back. (The Knights of Pendragon I#5) - Kate awoke, having had a vision of Dai's death. She attempted to get a warning to him, through W.H.O. Meanwhile Dai was traveling to the rainforests of South America, and encountered Captain Britain. (KOP#5, 11(fb)) - At the time Captain Britain was unaware he was possessed by the same Pendragon spirit that had once inhabited Lancelot, once prone to berserker fury in battle and given to mighty rages. In the heat of conflict he killed Dai, who was similarly being possessed by Gawain. (The Knights of Pendragon I#6) - Captain Britain was overcome with grief when he realized what he had done, and attempted to take Dai's body home to be buried. Three days after Dai's death, he was reborn as Gawain. He approached Captain Britain, and asked him to follow him. Meanwhile, Kate escaped from W.H.O. She traveled to the rainforests to find Dai, only for her helicopter to be attacked by the Bane. She was rescued by Captain Britain and Dai/Gawain. Dai/Gawain lead Kate and the Captain to the Green Knight, fighting more Bane along the way. In order to reset the balance, Gawain freely sacrificed his Pendragon spirit to the Green Knight so that he might bolster his failing strength. Upon making the sacrifice, Dai's returned to life in his original body. Later, Kate interviewed Grace at the Omni Corporation tower, warning her against further abuse to the environment. (The Knights of Pendragon I#7) - Ben Gallagher used his contacts at Fortune to fund a fact-finding trip to the Hebrides, to research Dolphin massacres. Meanwhile, Inspector Dai Thomas had been investigating a series of killings by the mysterious 'Jigsaw Man', identifying him as Dolph, the man who tried to kill him and Kate McClellan in Belize. He met with Kate and Brian Braddock to inform them, but Kate was in turn troubled by the appearance of Union Jack (Joseph Chapman). Joseph's body was undergoing changes as his Pendragon powers began to develop. In a state of confusion he approached Kate McClellan, claiming the Green Knight had said she would explain what was happening to him. (The Knights of Pendragon I#8) - Kate began researching Union Jack, and other war heroes such as Albion. Unknown to her Albion was in fact a teacher to her son, Cam McClellan, in his identity as Peter Hunter. Peter discovered that Cam had lost himself in the woods and went to find the boy. Upon finding him he realized the child had been invested with a Pendragon spirit, but was unable to cope with its power. Peter was unable to stop Cam's gym teacher, Mr. Tench, from confronting the boy. Cam lashed out instinctively, killing Tench with his enhanced strength. When informed of the accident, Kate sent Union Jack and Captain Britain ahead of her to investigate. Kate intended to follow in her car, but before she could do so she was attacked by Dolph. She managed to fight him off, displaying enhanced strength in the process, realizing that she too is becoming a Pendragon. Meanwhile, Cam had beaten back Captain Britain and evaded Union Jack, not realizing they were there to help. He ran away into the clutches of the new Bane leader, Grace. (The Knights of Pendragon I#9) - While looking into the Dolphin massacres at Craggansay Firth in the Orkney Islands, Ben Gallagher's Pendragon abilities began to develop. He made friends with Dionne Bell, a reporter for Astra TV and work colleague of Kate McClellan. Ben began to have strange visions, leading him into confrontation with Scarman. Scarman was possessed by one of the Bane, and was in charge of the cetacean cullings. He and his men would strike dolphins and whales in the head using gaffs, killing them in the their hundreds. The dolphins often took up to fifteen minutes to die in pain. Ben managed to communicate with the dolphins, but while he was distracted the Bane killed Dionne. When Ben realized what had happened, he attacked the Bane and forced Scarman to listen to the whale song. Scarman was overcome with remorse, and the Bane spirit possessing him fled. Meanwhile, Police from two counties had been deployed to search for the missing Cam McClellan, with help from Captain Britain and Union Jack. Also Peter Hunter took a break from work to look into the boys disappearance. Cam was, in fact, being manipulated by Grace. She sent Cam along with a troop of her Bane possessed minions to rescue Dolph from New Scotland Yard, where the murderer was being interviewed by Dai Thomas. Dai was badly hurt in the raid, but was able to let Kate know later as she visited him in hospital. (The Knights of Pendragon I#10, 11, 12) - Captain Britain, Kate McClellan and Union Jack had an encounter with the Bane at Omni Corporation headquarters while investigating Cam's whereabouts. Upon learning of the incident, Brigadier Alyssande Stuart of W.H.O. forbade Captain Britain to assist Kate's investigations any further. Fortunately she and Union Jack were approached by Ben Gallagher and Peter Hunter, who had met whilst both looking for Kate at Astra TV Tower. Peter explained to them what he knew about the Pendragons, drawing on his experience as Albion. He also asked Ben, who had been looking for Kate to talk about the death of her work colleague, Dionne, to show them the location of his grail. Whilst at the Kitsford Countless Stones they were attacked by the Bane. Ben fought them off and saved his new friends with his Pendragon abilities. They then headed to Spain, where Omni Corporation was involved in the development of the town Joselito, in hope of rescuing Cam. Whilst investigating the Omni Corporation site they found caves, once the site for sacred and bizarre rituals that Grace planed to destroy in order to resurrect the Red Lord. Their presence attracted the attention of Grace's business partner, Tony Stark. Tony was unaware of Graces true plans, and donned his Iron Man armor in order to attack Union Jack in the caves. Whilst there, Grace triggered a huge explosion and swamped the caves with toxic waste. However, Grace's plans appeared to backfire when the Green Knight appeared. The Pendragons battled the Bane, with assistance from Captain Britain and Iron Man. Grace was seemingly killed due to her vulnerability to Iron Man's armor. During the battle, Peter Hunter rescued Cam McCellan and reclaimed his Pendragon spirit. The damage done to the land was healed by Ben Gallagher's powers. Realizing they needed a base of operations, Union Jack brought a farm called Camelaird in Wiltshire, and accepted Tony Stark's offer to provide any hardware they might need. (The Knights of Pendragon#13) - While relaxing at Camelaird, Albion read to Union Jack from his tarot cards. As he did so the various Pendragons went about their day to day business. Kate McClellan returned to Astra TV Tower to find her office had been taken over by a rival reporter, Randolph Frewin. Randolph's investigations into Omni Corporation attracted the attention of the Bane, who sent Leo De Benning to tail him. Ben Gallagher called Kate from his editors office, where he was discussing a new book based upon his adventures to date, and arranged to meet up for a drink with her later. Former Pendragon, Inspector Dai Thomas, was approached by Mr. Frewin for an interview, but declined. Frewin later approached Cam McClellan, but was interrupted by Kate. As they argued, Leo De Benning attacked in his Bane form, but Kate fought back and killed him. She then left to meet Ben. Meanwhile, back at Camelaird, Albion's final tarot revealed a possible future: the Spiral Tower. (The Knights of Pendragon#14) - Ben, Kate and Union Jack traveled to Central Africa, where the Bane were running the poaching cartels, while Albion went to Bonn, capital of united Germany, to get information on the Spiral Tower from his old friend Dorfmann. The group in Africa encountered some of the Omni Corporation mercenaries that had previously attacked Kate and Dai Thomas in Belize, but were too late stop them killing a herd of Hippos (known as Kiboko in the local tongue) for the ivory in their mouths. The conflict drew the attention of the Black Panther, along with his friends Mr. Fantastic and the Invisible Woman. They joined forces and caught the poachers, except for the Bane possessing their leader, Mr. Robart. Robart attempted to escape in boat, but Kate blew the vessel to pieces with her Pendragon fire. One of his men gave them information on the whereabouts of their biggest buyer, and a Hong Kong market called the House of Orchids. Ben and Kate agreed to look for the buyer called McCinley in Australia, while the Black Panther offered to accompany Union Jack to the market in Hong Kong. Mr. Fantastic and his wife returned to New York, telling the Pendragons to call them if they needed any help. Meanwhile, in London, a young man named Adam Crown had a Pendragon vision, sensing that the group was separating. 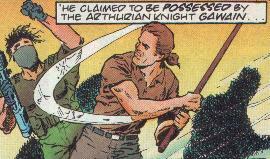 (The Knights of Pendragon#15) - Adam's visions led him to the Museum of Pagan Antiquities where he stole a sword. Scared the Police would find him, he threw the sword into a canal. He was surprised to see a hand rise from the waters and catch the sword. In Australia, Ben and Kate found McCinley, who had been slaughtering sharks and trading their fins with the House of Orchids. McCinley was one of the Bane, and was using his ability to turn into a shark-like monster called B'ngudja and kill bathers to justify the slaughter of the sharks. He lured Ben out to sea and attacked him. Ben was saved by a group of sharks who turned on McCinley, but he was still severely wounded. In Germany, Albion's friend Richard Dorfmann was killed by Grace. In Hong Kong the Black Panther and Union Jack were attacked by Ninja Bane while investigating the way to the House of Orchids. After much fighting, they realized the true threat was Dolph, who had been further mutated by the Bane presence within him. (The Knights of Pendragon#16) - The Pendragons finally began to realize that the Bane had deliberately split them up to make them easier targets. In Hong Kong the Black Panther and Union Jack fought Dolph, who grievously wounded them both. Union Jack managed to get the Black Panther to safety using his automated vehicle, Beryl. He stayed behind to hold of Dolph, and lost his life in the process. In Australia, McCinley caught up to the wounded Ben Gallagher. Kate blasted McCinley away and got Ben medical assistance, but things still looked grim. Likewise, in Germany, Albion was attacked by Grace upon discovering the Spiral Tower. The Pendragons' suffering was still being felt by Adam Crown as he continued his quest, recovering his sword and making his way across Salisbury Plain in Wiltshire. (The Knights of Pendragon#17) - Adam made his way to Blagdon Reservoir, near Glastonbury. Whilst punting on the reservoir he encountered the Lady of the Lake who assisted him in finding the Green Chapel, telling him the Sword of the Dawn would lead the way. When he finally reached the chapel he found King Arthur's empty sarcophagus, and the Green Knight waiting for him. Meanwhile, Kate had been searching the property of a land owner named Jenks in Cootamundra, Australia. She found his fridge was stocked with dead cane toads. Kate didn't realize it, but the cane toads toxin was needed by the Bane as part of the sacrificial ceremony that would resurrect the Red Lord. She called the Sydney hospital where she had left Ben Gallagher, only to hear that he had passed away. Shortly after she received a call from the Black Panther informing her that Union Jack was dead too, and that Albion was missing. Unbeknown to her, both Ben and Union Jack had awoke to find themselves in Avalon, and Albion had been sacrificed by Grace at the Spiral Tower, resurrecting the Red Lord in the process. Back at the Green Chapel, the Lady of the Lake had fitted Adam with armor, and told him to send out a call to the other Pendragons to prepare for the inevitable battle. He sent out a flock of the Green Chapels sentry owls to summon his fellow knights to him. (The Knights of Pendragon#18) - Kate and Dolph fought, but their conflict was interrupted by one of the sentry owls. Kate vanished right before Dolph's eyes. The sentry owls appeared to various others, including the Black Panther, Iron Man, Captain Britain, and Dai Thomas. They all found themselves transported to Avalon, along with an army of Pendragons resurrected from years past. Although the Bane outnumbered them a thousand fold, and they knew the Green Knight would not be able to resurrect them again, they fought against the Red Lord's forces. As Adam Crown finally confronted his opposite, Grace, he used his Pendragon to show her the hideousness of the Bane's cause and drive out the Bane from her soul. She and the other Bane began to turn back to normal, and the Red Lord left. Unfortunately, during the battle Ben Gallagher had been impaled upon Dolph's claws. Ben used the last of his healing abilities to save Union Jack, who had also been injured while fighting and defeating Dolph. Ben passed away for a second and final time. (The Knights of Pendragon II#1 (Fb)) - Unbeknownst to the Pendragons their battle with the Bane had been monitored by the Warhead known as Ortega. Ortega attempted to infiltrate the Green Chapel, but was attacked by one of the skeletal defense drones that protect it. Her tap-back returned her to safety, but she was barely alive. The Knights of Pendragon began to set up base at the Green Chapel, all except for Kate who left the team to finish Ben's book. (The Knights of Pendragon II#1, 2, 3) - Having been converted to the cause of good by Adam Crown, Grace became one of the Pendragons. She discovered an armory and some suits of ancient armor in the Green Chapel. One of the suits reacted to the Pendragon within her. The chapel's skeletal defense drones attacked her, but Albion and Adam came to her rescue. Grace showed them the armory, and they began to experiment with the armor. Meanwhile, on Earth, the Stark Enterprise robots at Questworld (Britain's first and only Arthurian theme park!) had begun to malfunction in large numbers. Union Jack quickly became embroiled in combat with them. Whilst he was busy fighting, one of the robots was possessed by the Pendragon known as Gawain. Believing one of the damaged robots to be Lady Guinevere, Gawain carried it away over Darkmoor. Gawain was followed at a distance by Breeze James, an operative of Mys-Tech. Once Gawain had left, the other robots became inert. Gawain attempted to give the damaged Guinevere robot food and drink, the later of which didn't go down too well with it's circuitry. Hoping to 'heal' it, Gawain decided to take it to Stoneyfast Abbey. Back in Avalon, Union Jack had arrived to inform the other Pendragons of the problems at Questworld. Before the Pendragons returned to Earth, Joey was provided with one of the suits of armor. Upon their return to Darkmoor, they encountered Iron Man and James "Rhodey" Rhodes. Meanwhile, Gawain had reached Stonyfast Abbey, where he met the Black Knight. The two fought, but Gawain was apparently 'saved' by Breeze James. Breeze set off her Mys-Tech beacon device, which summoned Magpie. Magpie fought with Iron Man and the Pendragons over who would take the Gawain robot. Ultimately Magpie was forced to withdraw, but the battle provoked a fight between Gawain and Union Jack. However Union Jack's armor wouldn't allow him to strike the robot with a finishing blow from his staff, telling him it wouldn't allow him to fill another Pendragon. Meanwhile, Breeze James had a Pendragon vision warning of danger at a nuclear fast breeder reactor in Cape Wrath, Northern Scotland. (Marvel Comics Presents#122/4) - The Knights opposed the plot of Shadow Wing--who had replaced Grace as the leader of the Bane, in which he attempted to use the Seeds of Winter to poison the lands of Britain so that nothing would ever grow on them again. (The Knights of Pendragon II#4) - The Pendragons took Breeze James, Gawain, Iron Man and Rhodey to the Green Chapel. After questioning Breeze James, Adam, Grace and Union Jack left for Cape Wrath to investigate her vision. Meanwhile Albion and Iron Man's examinations proved the Gawain robot had indeed been given a Pendragon spirit. Iron Man and Rhodey were called back by the Avengers, leaving Albion and Gawain to travel to Cape Wrath to assist the other Pendragons. A horde of Bane was inside the reactor. They intended for Iain Guthrie, who had been having visions of his dead wife, to explode the reactor. Already the radiation levels were too high for the human Pendragons to enter, so Gawain infiltrated the nuclear reactor alone. He single-handedly fought the Bane, and convinced Iain Guthrie not to detonate his explosives. Iain passed away from exposure to the radiation, but the authorities were called to leek and cordon of the reactor. Gawain had effectively prevented the situation becoming an international catastrophe. Meanwhile, back at the Green Chapel, Breeze James had found her own set of Pendragon armor. (The Knights of Pendragon II#5 (fb)) - While returning from Cape Wrath, the Pendragons intercepted a message which they believed to be from Dai Thomas. In fact the transmission had been faked by Magpie. (The Knights of Pendragon II#5) - Grace and Peter Hunter went to Rapunzels night club, in Londons west end, to meet Dai Thomas. Magpie ambushed them, and was shot by Dai. He managed to escape with one of the Pendragons bikes, and d-jumped to Avalon. Grace attempted to convince him that the radiation levels there would kill him. Falling for her ruse, Magpie departed with the stolen bike. Unbeknownst to him Grace had scrambled the bike's navigational memory. Albion and Grace returned to the Green Chapel to discover the other Pendragons armor's had evolved into new forms. (The Knights of Pendragon II#6, 7, 8) - The Green Knight showed Peter Hunter a vision of the world of Arakne under attack from the Warheads. He summoned the other Pendragons to the Green Chapel. They were mistakenly attacked by Arrakhyl but Albion put a stop to the fighting. Together, Albion and Arrakhyl briefed the Pendragons on the situation. They traveled to Arakne and fought the Warheads. Gawain was blinded, and Adam fell off a bridge. The other Pendragons had no choice but to retreat. Arrakyl led them to the Gossamer Tower where they met Malekyth, and discovered a picture of the spider god Arakthu. They noted the resemblance between Arakthu and Earth's Spider-Man. Albion, Grace and Union Jack traveled to Earth, where they found Spider-Man under attack from the Scourge, led by Malekyth. Meanwhile Gawain, Breeze and Arrakhyl stayed behind to guard the Gossamer Tower. The Pendragons and Spider-Man drove off Malekyth and the Scourge, who fled back to Arakne. Spidey joined the Knights in returning to Arakne to save it from the Warheads. Arrakhyl and the others managed to convince three of the Warheads (Liger, Misha and Stacy) that the Araknoids were intelligent and that stealing the Nucleolus would kill them. The other three Warheads (Evone, Grierson, Prizzi) teamed up with Scourge (the equivalent of Bane on Arakne). 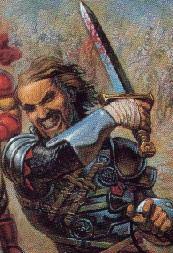 Crown, who had survived his fall by landing on the soft webbing in the caverns below, rallied the Spiridken to return to the surface and fight for Arakne. The Scourge fought both groups of heroes. During the battle Malekyth activated a timebomb which would destroy the Nucleolus (and herald the return of Tarashk). Malekyth was ultimately defeated, and his bomb cast into Ley Space. Having felt the power of the Green Knight, the Spiridkin became the basis for a new Pendragon corps, serving and training under Arrakhyl. In addition, the Araknoids repaired Gawain, restoring his vision and giving him a new face plate in the process. (The Knights of Pendragon II#13 (fb) - The bomb hurled into Ley Space by the Pendragons entered a portal to the dimension of Earth-313, destroying much of that world. (The Knights of Pendragon II#10, 11) - Union Jack and Jackie Crichton were attempting to relax at Falsworth Manor, but Joe kept thinking of Baron Blood. He had an eerie feeling the Baron had somehow returned. Although he didn't know it, he was correct, as Baron Blood had been revived by the power of the Bane. After a workout session at the Green Chapel, Albion had mentioned Grace had left for a board meeting at Omni Corporation. Breeze became concerned it was a trap because she knew that Omni Corporation was a secretly a division of Mys-Tech. She attempted to warn her, but couldn't reach her via their communications systems. Grace was taken to a sub-basement of the Omni Corporation tower. Once there Mys-Tech's Wychwood claimed to be a part of the Red Lord, and revealed his plans to resurrect him. He then confronted her with Baron Blood, who had been collecting the human sacrifices needed for the arcane ceremony. Grace pretended to be once more possessed by the Bane. She called Union Jack, under the pretence he would be needed as a human sacrifice, and told him Baron Blood had indeed returned. He contacted the other Pendragons to alert them to the situation, but maintained he would be able to deal with the situation himself. Once he arrived at the Omni Corporation tower, Grace dropped her pretence and helped fight Blood and Wychwood. Union Jack impaled the Baron with his staff. The vampire fell upon a huge spike in the vacant spot where the final human sacrifice should have gone. His impurity tainted the ceremony, preventing the resurrection of the Red Lord. (The Knights of Pendragon II#12) - Mys-Tech activated the Un-Earth, which affected the Green Knight. The Pendragons found he was dying, and traveled to London to investigate the source of his suffering. Upon arrival, they found London to be in a state of havoc. They fought a powerful demonic monster, who turned out to be the warm up for a Mys-Tech agent known as Skire, the King of Pain. Skire managed to burn out Gawain, kill Grace and Union Jack, and mortally wound Albion in a matter of minutes. Adam only managed to defeat the villain when he received a temporary influx of power from the Green Knight. The Green Knight then resurrected those that had fallen to Skire, and healed Albions wounds. Such a desperate gesture made the Pendragons realize how bad the situation was. They made their way to the Museum of Pagan Antiquities, and found Avengers quinjet parked outside along with the X-Men's Blackbird. Realizing the source of their problems lay inside, they charged into action. (Mys-Tech Wars#1) - Mys-Tech's completed development of their UnEarth, which they then utilized in an effort to take over the world. Across the Earth, the energy backlash was felt by mystics and sensitives, and it extended into the Green Chapel, where it was felt by the Knights. The Green Knight was wracked with agony by the assault on Earth. (Mys-Tech Wars#3) - The Knights (or perhaps their alternate dimensional counterparts, summoned by rents in the fabric of reality), arrived in the Museum of Pagan Antiquities, joining an international coalition of heroes against the forces of Mys-Tech, including demons and the Psycho-Warriors. However, Death's Head and Wolverine slew Mys-Tech's Crowe and Porlock; as the Mys-Tech Techno-Wizard's life forces were directly bound to the fabric of reality, their deaths threatened to cause all reality to unravel. (Mys-Tech Wars#4) - Dark Angel proved able to hold together reality temporarily, while the others fought through a horde of Mys-Tech's Psycho-Warriors, making their way to the UnEarth,. There six of the heroes served as surrogate members for the Techno-Wizards to repair the rift in reality. Dark Angel held them together, Professor X provided psychic power, Albion provided Earth magic, Dr. Strange provided sorcery, Death's Head provided cybernetic influence, and Motormouth...well, they needed six of them. The six surrogates successfully repaired the rift and reformed the Techno-Wizards, set back time so that the many deaths and the activation of UnEarth never occurred, and put a force field up around the UnEarth to prevent Mys-Tech from accessing it again. Due to the reversal of time, only Dark Angel and the other five who served as surrogates remembered that the struggle had ever happened. 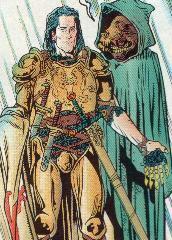 (Knights of Pendragon II#13-15) - Death's Head was hired by the Lemurians of Earth-313, who desired revenge against the Knights of Pendragon for the damage done to their world. Near their base in the Green Chapel, in Avalon, Death's Head defeated Breeze James and Crown, but was subdued by Union Jack with one of the stasis devices he had brought to contain the Knights. Back at the Green Chapel, Gawain awoke from a dream of Earth-313. As Gawains visions had been driving him crazy, Albion began reading up on the nature of the Pendragon vision. He theorized that, due to the sensitive nucleolus crystal forming his face, Gawain was more vulnerable to the visions. Meanwhile, Death's Head was freed by Magpie, another agent of the Lemurians, and battled the assembled Knights. The Lemurians then teleported to Avalon to carry out the death sentence they had ordered for the Knights. The two teams fought heavily until Albion psychically probed a Lemurian's mind. He learned the truth that the Knights were indeed responsible for the destruction done to Earth-313. Meanwhile Magpie had sneaked into Green Chapel on his own agenda, and was preparing to summon the Red Lord. He was followed by Death's Head, who had realized the Knights were not the genocidal lunatics that the Lemurians had portrayed them to be. Gawain also sensed the presence of Bane, and the Knights managed to convince the Lemurians to investigate. By the time they arrived Death's Head had dealt with Magpie, but the Red Lord was almost fully manifested. Crown drove the Red Lord back across the portal, but only at the cost of being trapped in the Red Lord's realm with him. Death's Head tossed Magpie through the portal into the Red Lord's realm, as well. Albion, Breeze and Gawain traveled to Earth-313 with the Lemurians to help rebuild their planet. Only Grace and Union Jack remained behind to safeguard their own world. (Dark Guard#1-4) - Albion was temporarily taken away from his fellow Pendragons and summoned to the Refuge by the Time Guardian. 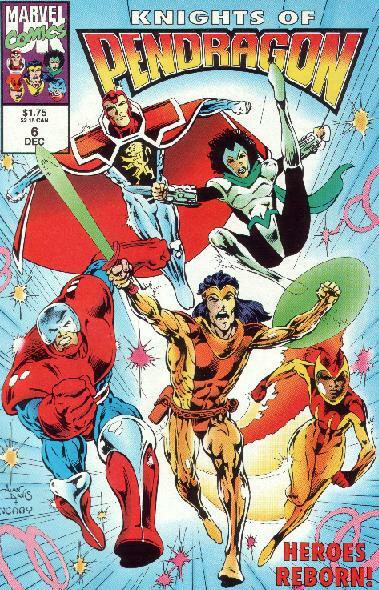 It was the Time Guardian's intent that Albion become part of a group of heroes that would prevent Mys-Tech from spreading throughout the universe. Despite his initial concern about being taken away from his duties as a Pendragon, the Time Guardian assured him he had been plucked out of time and he would be returned to the point at which he left once he had completed his work with this new team. Albion joined the Dark Guard on a mission to Eopia. Mys-Tech had infiltrated two opposing nations there, the Egaliterns and the Technarchy. Heavily outnumbered, they made a strategic withdrawal. However, the mutant Mys-Tech agent Collapsar kidnapped Killpower and Tigon Liger. While Death's Head and Motormouth went to rescue them, Albion joined Dark Angel and Ultra-Marine Major Nasca on a mission to the Egalitaern territories of Eopia. Governor Trusivor mistook them for Technarch assassins and set his superpowered body guards upon them, two gaint creatures known as Sunder and Permafrost. Trusivor was unaware the two superbeings were actually Mys-Tech constructs, but Albion and his friends defeated them and then managed to convince him of the truth. The Dark Guard discovered that Tyburn was responsible for the situation on Eopia, and convinced Trusivor to begin peace negotiations. However, Demogog Tansteel launched two cruise missiles upon the Egaliterns. Albion helped Major Nasca to stop the missiles, and Tansteel was stopped by Liger and Killpower. The Dark Guard returned to the Refuge, secure in the knowledge that peace negotiations could now be restored. (Die-Cut vs G-Force#1 (fb)) - Peter Hunter/Albion warned his friend Professor Daniel Jones about the dangers of taking a job offer from Mys-Tech. However, as the Time Guardian had directed him, Albion instructed him to go ahead and take the job, though he gave him a trans-warp communicator to hopefully ensure his safety. (Die-Cut vs G-Force#1) - Albion returned to the Green Chapel from Earth-313, reuniting with Grace and then attempting to reach Professor Jones on his communicator. (Die-Cut vs G-Force#2) - The Time Guardian informed Albion that Professor Jones had saved the world, though he could not be sure of Jones' survival. Albion expressed to Grace his frustration at blindly following the Time Guardian and endangering his friend's life. Comments: Created by Dan Abnett, John Tomlinson, Gary Erskine, and Andy Lanning. So people are clear which Arthurian characters the various Knights represented, Albion was Merlin, Adam Crown was King Arthur, Ben Gallagher was Percival, the robotic Sir Gawain was... Gawain obviously, Kate McClellan was Guinevere, as was Breeze James after that spirit left Kate, and finally Union Jack was Lancelot. Dai was also Gawain, and I believe Grace was meant to be Morgause. In addition, Albion was not initially possessed by the "Merlin" Pendragon, but rather Herne the Hunter. That being said, it is not the actual spirits of the above beings that possessed the Knights, but rather the same spirits possessed the above beings as possessed the Knights. Who the frick is Morgause? "Morgause was the half-sister of Arthur who married Lot. She was the mother of Gawain, Gaheris, Agravain, Gareth, and Mordred. According to the Enfaces Gawain, Lot was her page with whom she had an intrigue, as a result of which Gawain was born. In Malory she is Lot's queen who, as the result of an amatory encounter with Arthur (who did not know they were related), gave birth to Mordred. Morgause was slain by her son Gaheris who found her in a relationship with Lamorak, whose father, Pellinore, had slain Lot. Morgause does not seem to have been the original name of this character. In Geoffrey, the wife of Lot is called Anna, sister to Arthur. In De Ortu Waluuanii the part taken by Morgause in the Enfaces Gauvain is assigned to Anna; and the name Morgause itself seems to be in origin a territorial designation rather than a personal name, for in Diu Crone Gawain's mother is called Orcades or Morchades, which seems to be taken from the Orkneys (in Latin: Orcades), the name of one of Lot's kingdoms, and Morchades seems to be a variant form of Morgause." If any of the details from the first volume of Knights of Pendragon seem a little gory, I apologize. However the comics were attempting to deal with some extremely serious issues regarding the environment and animal rights. Out of respect for the creators of those comics, who clearly felt deeply about these issues, I've tried to address those issues too. The first Knights of Pendragon series was printed on a special environmentally friendly recycled paper, using similarly designed inks, etc. "I think it's safe to say that the Pendragon is not representative of any one individual. It is like mystic DNA, picking up features from its previous owner as it passes from person to person. That's why Dai became Gawain; because he'd picked up that particular force, inheriting all it's features." As this profile should make clear, not all of the people chosen as champions by the Green Knight have been so obscure. Apart from fellow Marvel UK characters Captain Britain, Dai Thomas and Union Jack, there was also the Black Panther (hinted to have the Pendragon spirit of a certain Robin of Locksley (Robin Hood) in KOP#18) and Iron Man (recognized as Bedevere by the Gawain android in KOP II#4). That said I didn't list Black Panther, Captain Britain, Iron Man or Dai Thomas as team members. However, they should still be considered as having been Pendragons. In the pages of Heroes for Hire the the Whitman Black Knight was given the title of "Pendragon" by the Lady of the Lake. What relationship there is between this "Pendragon" and the Pendragon of Knights of Pendragon is unclear. I'm not entirely clear what difference the Pendragon armors 'evolution' made to their abilities, if any. 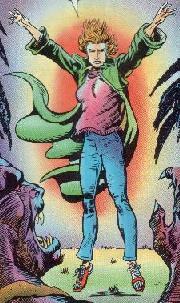 The new look was designed by Alan Davis, who also was responsible for the art on many of the covers throughout the first volume. The pages in Volume 1 of Knights of Pendragon were numbered; I stuck to that numbering below. To be consistent, page numbers I've given from Volume 2 I used the same numerical system as the first volume: counting the cover as page 1, and including any adverts.